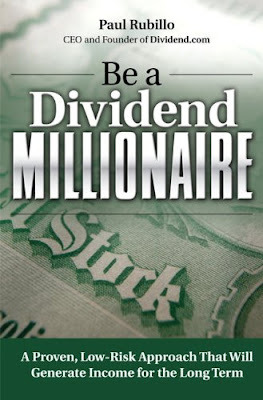 The book of the week was Be a Dividend Millionaire by Paul Rubillo. This book is more of a 'how-to' book on dividend stock investing. However, there is a lot of information on just basic personal finance included. I go back and forth on the necessity for Rubillo to discuss paying down debit and impulse buys in a book that touts teaching about dividend investing. I understand that you probably should have your finances under control before you start doing any investing but it was just a little odd that this book went into all that. And it wouldn't make me question it if it weren't for the fact that about half the book is about personal finance and money saving tips including everything from saving on your insurance to setting goals as a family. Just not expected and probably not the right book for the information. I say that because as a consumer of the book I have read plenty of books about personal finance, I bought this one to learn about dividend investing and I would much rather see those 70 pages dedicated toward the main subject matter. Now, about Dividends... a dividend stock is a share of stock you own that periodically pays out portion of the companies earnings and the payout is called a dividend. Dividend stocks are nice because they include the benefit of cashflow in the form of dividends while simultaneously providing capital gains on the stock side. It is really easy for anyone to invest in these stocks. You can go to Sharebuilder.com and make a little portfolio for as little as $25 a month. I discussed my thoughts on Sharebuilder last month. I use it for some of my investing and it treats me well. To learn more about stocks that payout some good dividends you should consult Dividend.com which is the creation of the author of this book. It is very comprehensive site on the subject that has a newsletter with really good information. I thought this book was pretty good although I don't think it was as good as it could have been. I did have some take aways and that made the book worth it to me... you should check it out. As always, If you have any questions don't hesitate to ask!